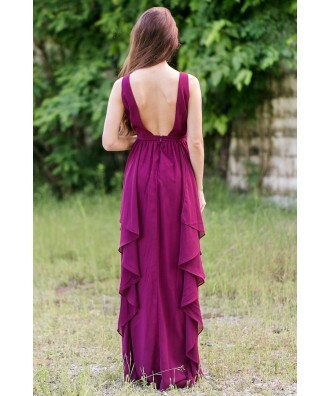 You have added Ruffled Romance Maxi Dress in Plum Purple into shopping cart. This dramatic and romantic maxi dress is perfect for bridesmaids! The Ruffled Romance Maxi Dress is fully lined and is made of chiffon. It has wide shoulder straps, a V neckline, and a lightly padded bust. The banded empire waist gives way to the full length maxi skirt. Vertical ruffles down the front as well as the back of this dress add a girly touch to this look. A hidden back zipper completes this dress. The Ruffled Romance Maxi Dress would look perfect paired with strappy heels and some pretty jewelry. Details: Fully lined. Hidden back zipper. Lightly padded bust. 100% polyester. Lining: 95% polyester, 5% spandex. Dry clean only. Small measurements: Length from top of shoulder to hemline: 59". Bust: 34". You have added Ruffled Romance Maxi Dress in Plum Purple into Wishlist. You have added Ruffled Romance Maxi Dress in Plum Purple for Stock Notification. 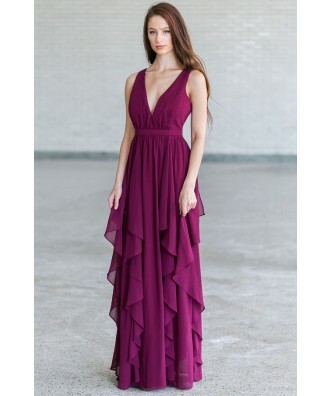 You have set Ruffled Romance Maxi Dress in Plum Purple as a loved product. You have removed Ruffled Romance Maxi Dress in Plum Purple as a loved product.